Fr Peter Pidskalny, CSsR has died. He passed away in Saskatoon on Sunday evening, 15 October 2017. Metropolitan Lawrence Huculak, would like to express his condolences to Fr Peter's family and confreres within the Redemptorist community - as well as the whole Church in Canada upon the loss of a truly conscientious and dedicated priest. Wednesday October 25th at St. Joseph’s Ukrainian Catholic Parish church (250 Jefferson Ave.) at 10:00 AM, with interment to follow at the Redemptorist Fathers' section at Holy Family Cemetery north of Winnipeg. Vichna yomu pamyat'! Вічна йому пам'ять! Receptions to follow each service. - Fr. Larry Kondra, C.Ss.R. Fr. Peter Pidskalny, born 27 July 1945 in Ethelbert, Manitoba, was the eldest son of John and Mary Pidskalny. Fr. Peter, his sisters, Sr. Anne Pidskalny, SSMI (Winnipeg, MB), Genevieve Morris (Portage la Prairie, MB), Jo-Anne Heuser (Calgary, AB), and brother, Fr. Joseph Pidskalny, OSBM (Vancouver, BC), were raised in Ethelbert, Manitoba, where the family has roots going back to 1897. The late Fr. Vital Pidskalny, OSBM, the late Fr. Soter Pidskalny, OSBM, and the late Sister Donna Pidskalny, SSMI, are his father's brothers and sister. Fr. 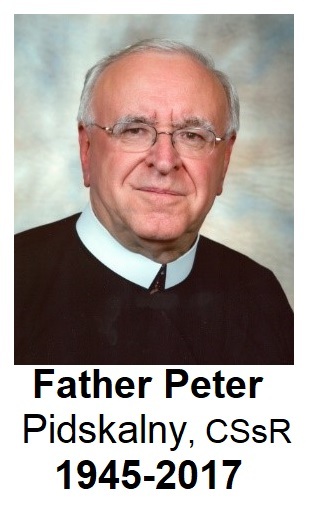 Peter graduated from St. Vladimir's College in Roblin, MB in June 1963. That same summer he entered the Redemptorist Novitiate in Meadowvale, ON where he professed his first vows on August 28, 1964. His studies for the priesthood were in St. Mary's Seminary, Yorkton, SK (1964-65); St. Alphonsus College, Suffield, Connecticut (1965-69); St. Paul University in Ottawa (1969-72). He also took studies in Ukrainian at Ottawa University and Harvard University. On May 14, 1972, Bishop Michael Rusnak, CSsR ordained him to the sub-diaconate at St. Mary's Church in Toronto. He was ordained deacon by the late Metropolitan Maxim Hermaniuk, CSsR. at Ss. Vladimir & Olga Cathedral on May 28, 1972. Later that summer, on August 19, Metropolitan Maxim ordained him to the priesthood at Ss. Peter & Paul Church in Ethelbert, MB. His first assignment was to St. Mary's Parish in Yorkton, SK (1972-73), where, besides being assistant pastor, he was also chaplain to the Eparchial U.C.Y., the Knights of Columbus, and the Catholic Schools. In 1973 he was assigned assistant pastor to St. John's Parish in Newark, New Jersey, where he also taught religion at St. John's Ukrainian Catholic School and 'Ridna Shkola' in Newark. In preparation for a teaching career, he studied at the Faculty of Education at the University of Manitoba and the Faculty of Mathematics at the University of Saskatchewan. From 1975-96, he was professor at St. Vladimir's College in Roblin, Manitoba where he taught Mathematics, Ukrainian, General Sciences, and Computer Science. He has a love of mathematics and sciences and enjoyed sharing it with the students of St. Vladimir's. At St. Vladimir's College, from 1978-94 he was principal, Director from 1994-95, and Spiritual Director from 1995-96. During this time he took one year of sabbatical studies at St. Michael's College, Toronto School of Theology (1981-82). For 12 years he served the parishes of Benito and Swan River, and for 8 years the parishes of Russell and Petlura. He was also chaplain for the Benito Council of the Knights of Columbus for many years. He has interests in many fields. His hobbies include photography, astronomy and ham radio (his amateur radio call is VE5PE). Fr. Peter was the associate pastor of the Wynyard Pastoral District from August 1996 to July 1999. He was the pastor from August 1999 to July 2002. From August 2002 until July 2005 he was the pastor of the Ituna Pastoral District and Local Superior for the Wynyard-Ituna District. On August 1, 2005 he became pastor of Sts. Peter and Paul Ukrainian Catholic Church in Saskatoon.